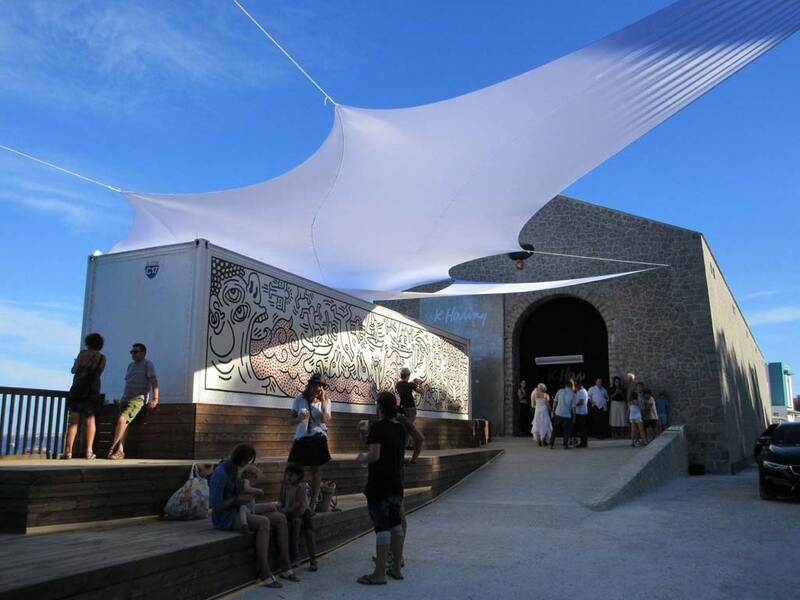 Lio Malca presents the 3rd summer exhibition in Ibiza at La Nave in Salinas from July 1st. 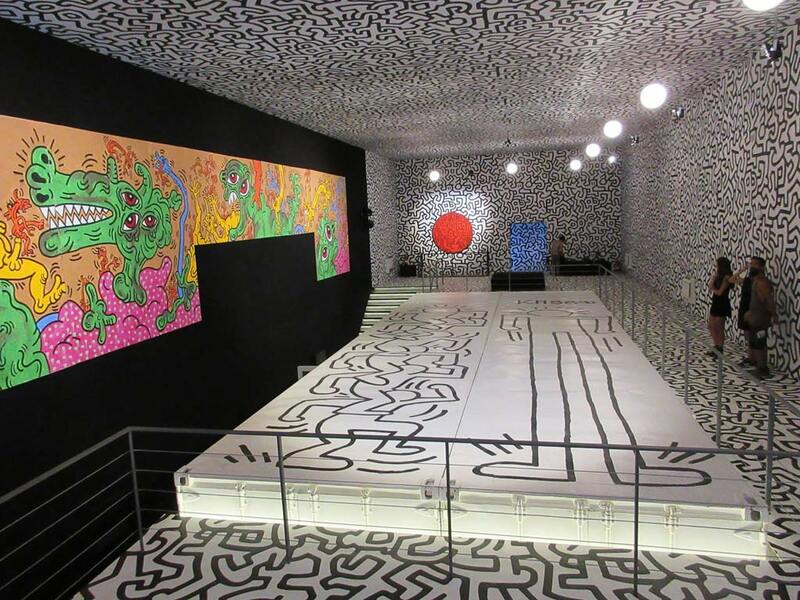 The exhibition features four monumental works by American artist Keith Haring in an exceptional exhibition that will once again transform this old salt warehouse into a dynamic space, allowing the island and its visitors to be part of Keith Haring’s world for the first time. On display will be Untitled (DV8), Channel Surf Club – Knokke, Untitled (Headstand) and Tokyo Pop Shop. La Nave Salinas is in a warehouse that was constructed in 1941 to store the salt harvested from the nearby salt flats, built as part of a jobs program during the post-civil war crisis in Spain. Art collector and patron Lio Malca renovated the 700 sq meter structure in 2015, opening with a successful exhibition by New York-based artist KAWS, featuring a 21 feet tall sculpture which drew over 5,000 visitors. Today, La Nave Salinas is an exhibition space with cutting-edge programming open to the public during the summer season. The purpose and philosophy of the gallery is to bring art closer to the public and share Lio Malca’s collections and other works with the island and its visitors. Since embarking in the New York art world in the early 1990’s, Lio Malca is a top collector of contemporary art who believes that art should be accessible to everyone. Specialising in Keith Haring and Jean-Michel Basquiat, he is a key lender and advisor in exhibitions showcasing their work around the world. He owns a gallery in Chelsea in New York and is also the owner of Casa Malca, a private luxury hotel in Tulum (Mexico) that features artworks from his private collection. Keith Haring also believed that art should be accessible to everyone; a philosophy developed early on in his career with his iconic subway drawings in New York to his large outdoor sculptures and murals around the world until his death in 1990. Born in Pennsylvania in 1958, he developed a love for drawing at a very early age, learning basic cartooning skills from his father and the popular culture around him, such as Walt Disney and Dr. Seuss. 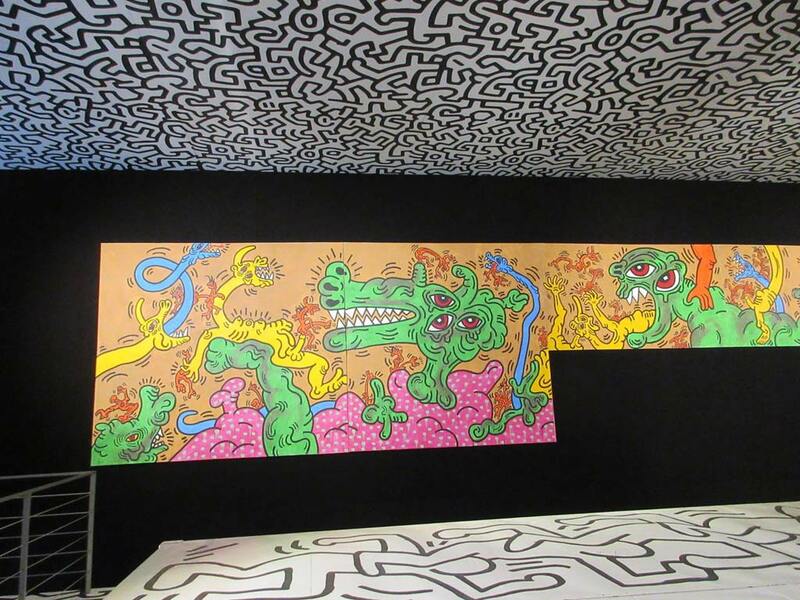 Haring moved to New York City in 1978 where he enrolled in the School of Visual Arts (SVA). As a student, he experimented with performance, video, installation and collage, while always maintaining a strong commitment to drawing. In 1980, he started to use the city as his own canvas. He first started off using chalk to create his drawings in the NYC subway stations and his work soon became increasingly displayed, from the public murals to nightclubs and then to galleries and museums around the world. He died in 1990 at only 31 years of age, but his art, with its deceptively simple style and its deeper themes of love, death, war and social harmony, continues to appeal strongly to viewers over generations. 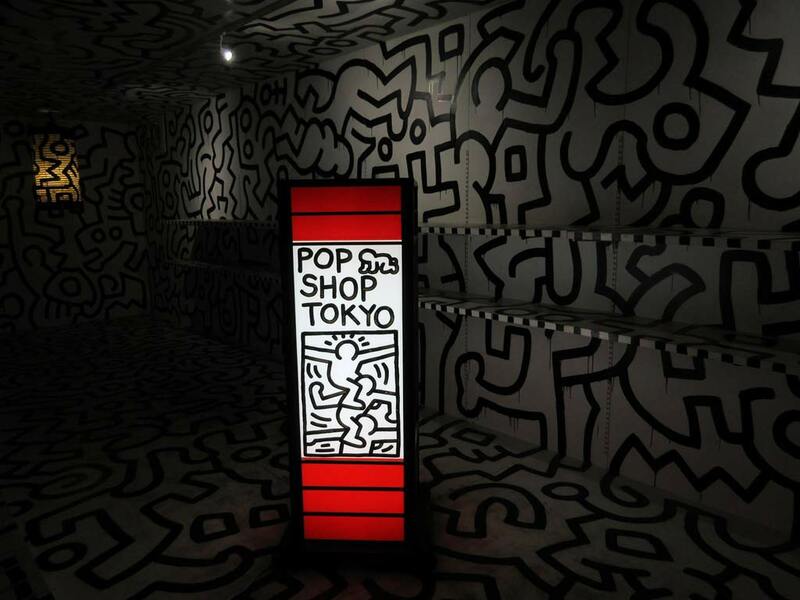 The idea of the Pop Shop Tokyo was born after the success of the Pop Shop in New York that opened in 1986. The Pop Shop in New York became a key place in his artistic practice – in this space, and in line with the philosophy of pop art, his art was accessible to all, he sold t-shirts and novel articles with the images of his works and those of other contemporary artists like Kenny Scharf and Jean Michel Basquiat. 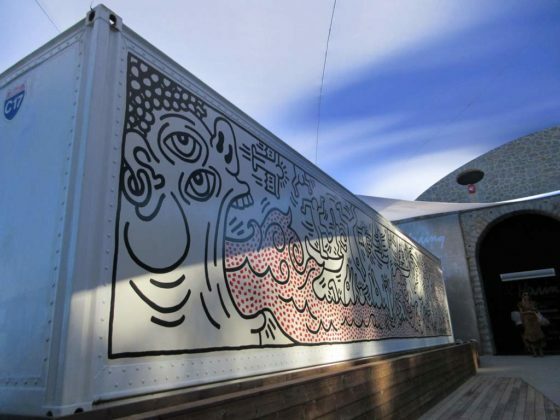 In late 1987 Keith Haring traveled to Japan and acquired two 40-foot containers that would become the infrastructure of one of his larger scale projects. He painted and furnished the interiors with hand-painted wooden panels, creating an immersive experience in his line of aesthetic work. 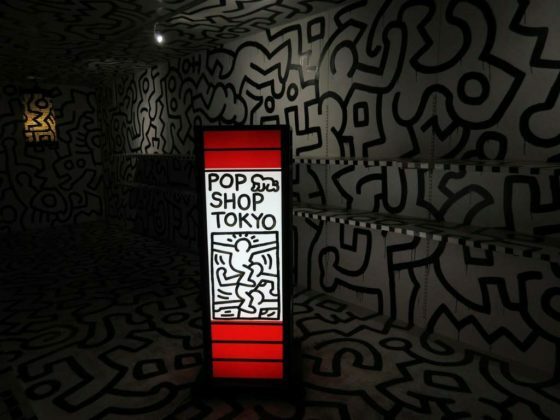 In January 1988, the Pop Shop Tokyo opened its doors in the capital of Japan with the intention of continuing the spirit of the Pop Shop New York store and sharing its philosophy of art for all. Without knowing its whereabouts and after a long search, it became part of the collection of Lio Malca in 2004. This is a five-panel mural that was originally commissioned by Dr. Winkie, a friend of the artist and owner of the iconic DV8 Club in San Francisco. 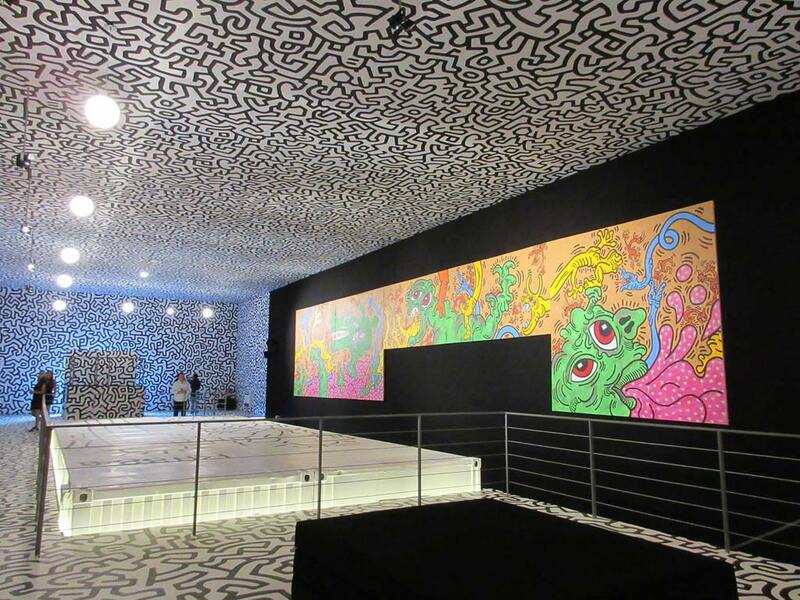 Numerous charity, cultural and social events were held in the space until the club closed in 1997, becoming an icon of the ‘Bay Area’ movement that defined the nightlife of California at the time. On July 6, 1987, Keith Haring painted a mural on the outside of a large container he discovered on the beach in Knokke, Belgium that was used to store surfboards and equipment for the Channel Surf Club. 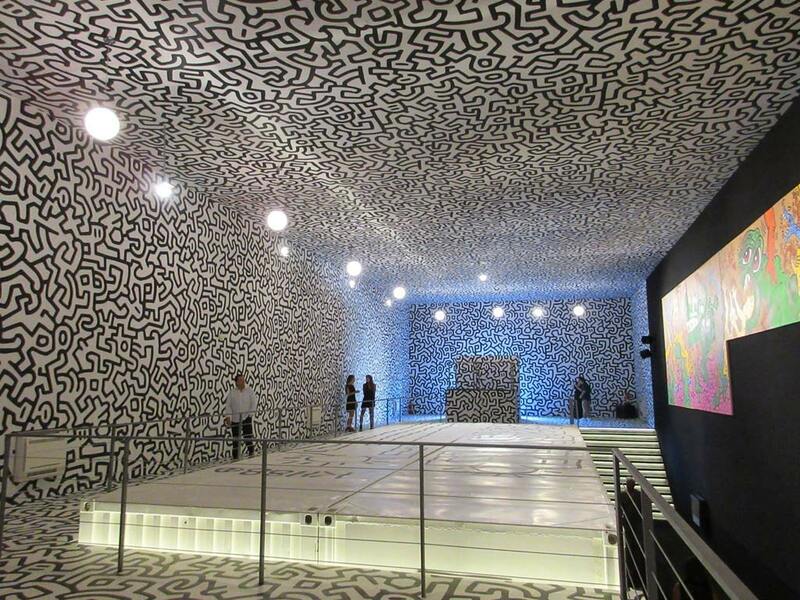 Haring painted the entire front with black and red paint in a single day. The mural became a symbol of the ‘surfer culture’. The energy and innovative environment of the 1980s created a boom in music, dance, fashion and art. 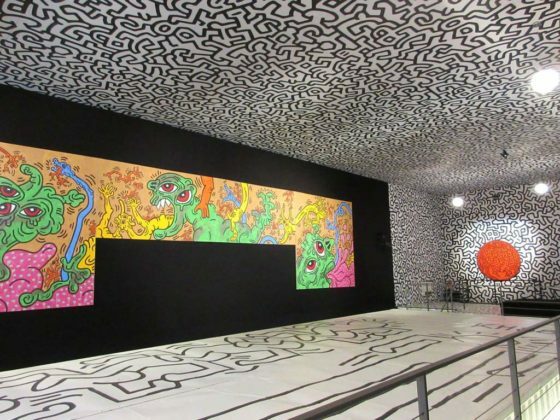 Haring was fascinated by the choreographed breakdancing routines and street dancing which was becoming common and which he translated into a series of unique sculptural pieces. Between 1985 and 1989, he created 13 monumental sculptures, which were exhibited on Park Avenue between 53 and 74, in Manhattan, New York, ten years later, from June 16 to October 10, 1997. Untitled (Headstand) was one of the sculptures of this exhibition, truly representing the form of ‘breakdancing’. “I have visited Ibiza very frequently during the last decade and a question that I’ve constantly asked myself was how could I show my gratitude to the island that has given me so much. After 10 years, I visited La Nave and it was an instant reaction. The exhibition runs until September 30th. La Nave is on Carrer la Canal 2, just along from the end of Salinas beach near the salt dock. Open Tuesday-Sunday from 11am-1pm and 5pm-10pm.